While in NYC this past week for BlogHer, my friend Darlynn and I ventured to a place we normally avoid - Time Square. Why would we do that to ourselves you ask? 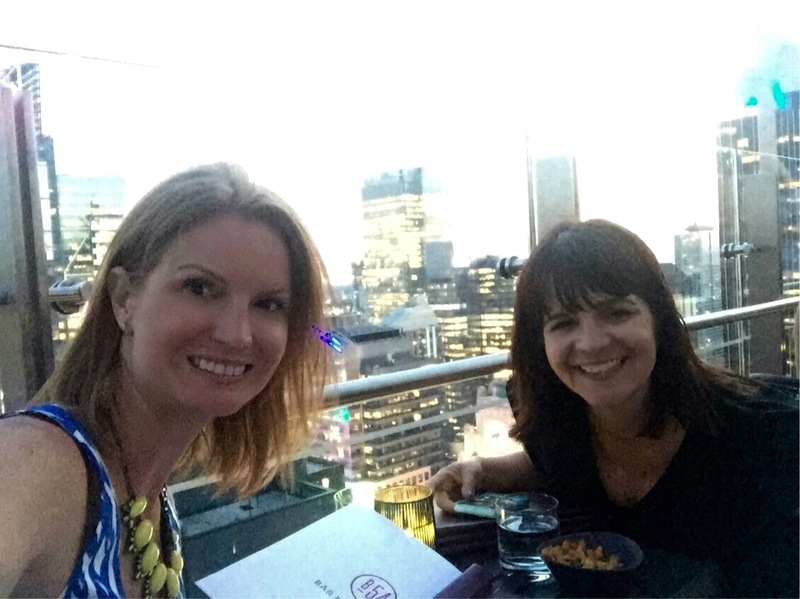 Oh because we had a great meal with the best view in the city. We experienced Bar 54 located on the rooftop of Hyatt Time Square, the tallest rooftop lounge in the city and for the first time I can recall, we had a very enjoyable time in Time Square. 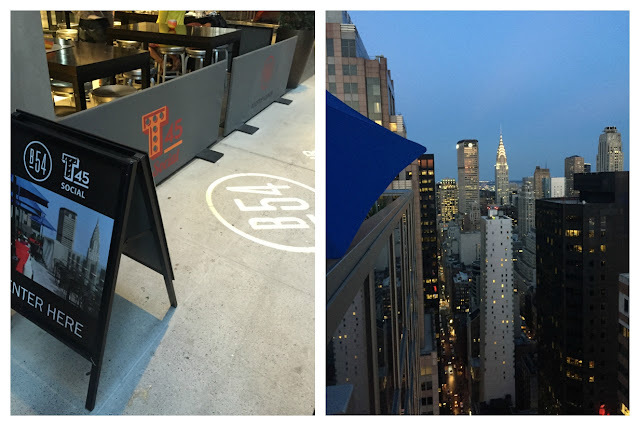 Bar 54 has extensive views that stretch across Manhattan from the Hudson River to the East River. They offer a wide variety of hand crafted cocktails, fine wines and delicious small plates. Having a dinner at Bar 54 was the perfect way to spend our Thursday night in the city. We were both looking for a relaxed evening, where we could catch up on life while eating delicious food. This we got, and more! Since both Darlynn and I are still living in the post-SATC era, we both feel the need to order a Cosmo whenever in NYC. This wasn't the only time this trip we channeled Carrie Bradshaw. The Cosmo at Bar 54 was delicious, all of the juices were fresh (except the cranberry). What makes a perfect cosmo even better? A Cosmo with a view. Our first course made it's way quickly to the table - candied bacon. I am a huge fan of bacon, and throw some praline on it - we have a winner. When it came time to order our second drink, we both went with the Moscow Mule made with homemade ginger beer. This drink didn't last long in this world. It was Moscow Mule perfection. We decided to split two small plates as neither of us were too hungry. It was the perfect amount of food for two. Eventhough I had a burger at lunch this day, I couldn't say no to the Bar 54 Burger. The first thing I read on the description was "truffle relish". I believe curse words came out both of our mouths after first bite. Yes, it was that good. I am in search for the truffle relish recipe and would go back to Bar 54 every trip to NYC going forward just for this burger. Darlynn picked out the Porchetta Sliders with pickled cucumbers. The sliders were delicious, the porchetta was perfect and all the flavors complimented each other nicely. Other things you can expect to find on the menu: Pigns in a blanket, asparagus bruschetta, deviled eggs, vegan flatbread and much more. The prices for the plates range from $7-$25. We ended our meal with a nightcap, trying out two of Bar 54 signature cocktails. On the left: Santana's Sour, Tequila, lime, jalapeno, cilantro and pineapple. This was a bit spicy for the two of us but for those who like the heat, it had amazing flavors. On the right: Hawaiian Iced Tea, orange vodka infused with Liliuokalani Tea, Lemon, Mint and Water. I have found inspiration for a new beach cocktail!!! Hyatt Time Sqaure is located at 135 West 45th Street, NY NY. 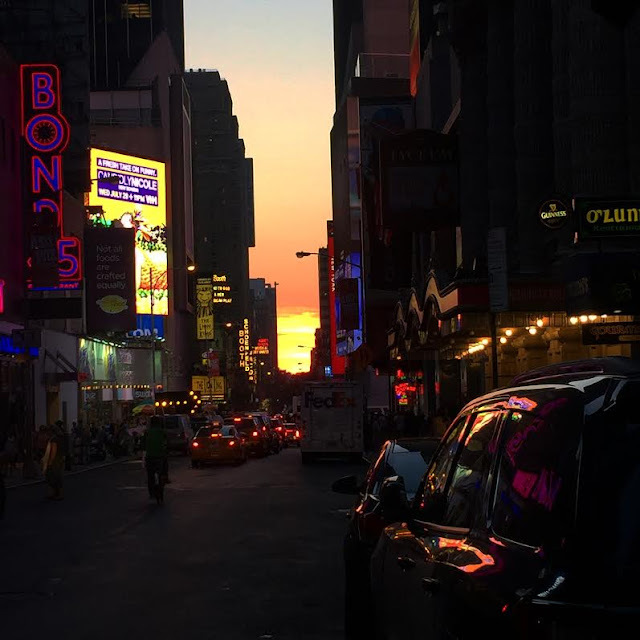 I will leave you with one final photo - We were a week late for “Manhattanhenge” but still experienced a stunning sunset upon arriving at Hyatt Time Square.